Just the boy needed lunch today, so I asked for his request. He wanted grapes and sandwiches. easy enough! Ben had little teddy bear shapes sandwiches (look sideways if you need to! 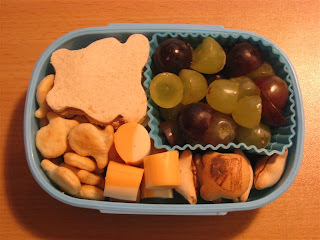 ), some parmesan goldfish, cheese, a couple of koala & panda cookies, and purple & green grapes.